Premier League Champions Leicester City were presented with the trophy on Saturday evening at the King Power Stadium, after a 3-1 victory against Everton. The club have delighted and amazed their fans, finally winning the league in their 132nd year. The atmosphere began to build around the ground many hours before kick-off, and an emotionally charged crowd were brilliantly serenaded by opera legend Andrea Bocelli, for whom the heavy rain obligingly held off for a spell. Claudio Ranieri replaced the suspended Huth and Drinkwater with Wasilewski and King, Albrighton came in for Schlupp and Vardy returned to the side after his two game ban. It only took City’s leading scorer five minutes to find the net, with Ranieri’s side showing no hint of taking their foot off the accelerator now the title had been won. A Mahrez throw from the right found King, who curled a fine cross into the goalmouth and Vardy popped up between Stones and Oviedo to send it past Robles with a deft touch. The party moved up another gear. King headed straight at Robles when well placed and then Fuchs was denied his first goal of the season with a timely Lennon block. In a rare Everton attack Wasilewski got a block on a chance that almost fell for Lukaku. In increasingly hard rain, Kante fired in a shot that Robles couldn’t hold, but the Everton keeper recovered to deny Okazaki a follow-up chance. The City fans didn’t have long to wait for a second goal however. In the 33rd minute Mahrez jinked through the Everton defence on the right. Baines got a tackle in but only succeeded in teeing up King. The club’s longest serving player timed his run beautifully and produced his trademark finish from ten yards. City were denied another chance when Okazaki sent Mahrez through but he was hauled over by Pennington, who was booked. Mahrez then nodded over the bar in the last action of the half. Everton had their best spell of the game early in the second half, but Niasse’s lob and Lukaku’s backheel both failed to beat Schmeichel. Fuchs, still in search of his first goal, sent a 30 yard free-kick over and bar and also had a shot blocked by Robles, while at the other end Schmeichel produced a decent save to deny Lukaku. Ranieri made his first change in the 62nd minute, bringing Ulloa on for Okazaki, and City made it 3-0 a couple of minutes later. As Vardy hared into the penalty area, Pennington clipped his heel for a clear penalty, which the England striker blasted past Robles. 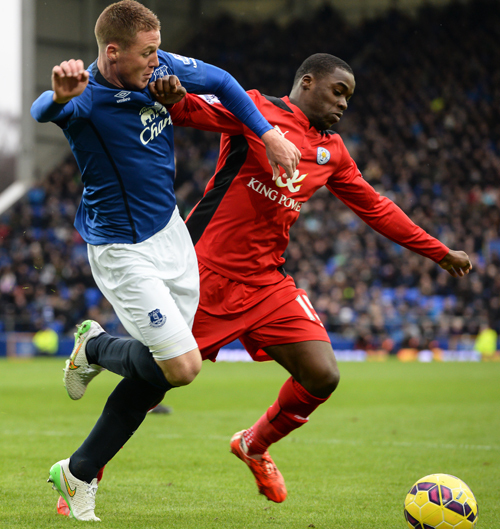 The applause rang out again as Schlupp replaced Albrighton soon after this. Vardy, in down the left fired in a low shot, but was denied his hat-trick by Robles, who got a leg to it. In the 72nd minute Gibson took Schlupp out in the area for as clear a penalty as you could ever hope to see. Vardy stepped up again, but this time sent his effort sailing into the Kop, his hat-trick denied again. City threatened a fourth, but several headers from Ulloa went narrowly over. Instead it was the Everton fans, sharing the away corner with perhaps hundreds of City interlopers, who had some rare cheer when Mirallas pulled one back with two minutes remaining. Sheer persistence, and a bit of luck, took him past Kante and Wasilewski before ruining Schmeichel’s clean sheet. Mahrez was replaced by Gray in injury time, perhaps only to allow the PFA Player of the Year an ovation of his own. The final whistle heralded City’s 23rd win of the season, and took them to 80 points. The players left the field and changed back into this season’s kit, having given next season’s a preview for the game. Alan Birchenall brought the trophy out wearing an expression that was an absolute picture. Then Claudio and his players filed out, onto the hastily erected presentation platform. City fan Steve Worthy handed the trophy over to captain Wes Morgan who insisted that Ranieri had a hand on it when it was lifted into the air, the cue for fireworks, glitter bombs and a thunderous ovation from the 30,000 lucky enough to have been here on this momentous day. It was the start of a party that would spread across Leicester and go on all night. 2015-16 was an astonishing one for our beloved club Leicester City. One that no supporter of the club could ever have seen coming. If the club continues to do things the right way, there is no reason why this can’t just be the beginning. Leicester: Schmeichel, Simpson, Wasilewski, Morgan, Fuchs, Kante, King, Mahrez (Gray 90), Albrighton (Schlupp 66), Okazaki (Ulloa 62), Vardy. Subs Not Used: Schwarzer, Chilwell, Amartey, Inler. Everton: Robles, Baines, Stones, Pennington, Oviedo, Lennon, Cleverly (Gibson 62), McCarthy, Barkley (Osman 81), Niasse (Mirallas 62), Lukaku. Subs Not Used: Howard, Mirallas, Connolly, Besic, Dowell. Referee: A Marriner. Attendance: 32,140. If you want every issue of The FOX – The Leicester City fanzine posted out to you on publication day next season wherever you are in the world, then take out a subscription – available from today. You can either print out and post the form below with a cheque, or pay online via Paypal. UK Subs – £16.95- CLICK HERE. Claudio Ranieri made one change to his starting XI with Albrighton in for Inler. Arsenal made a worryingly easy breakthrough early on but Ramsey’s shot was blocked by Huth and Cazorla’s follow-up saw a well placed De Laet clearing off the goal line. City than had a couple of chances: Schlupp’s shot being well saved by Čech, before Vardy’s low drive took a slight deflection which saw it hit the foot of the right hand post. 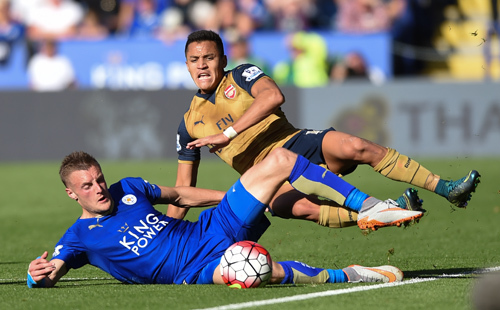 Vardy converted his next chance, in the 13th minute. Kante won the ball from Ramsey in City’s area and fed it to Drinkwater, who sent Vardy in down the right. A good first touch with his head saw him cutting in towards goal before sending a superb finish round Čech. 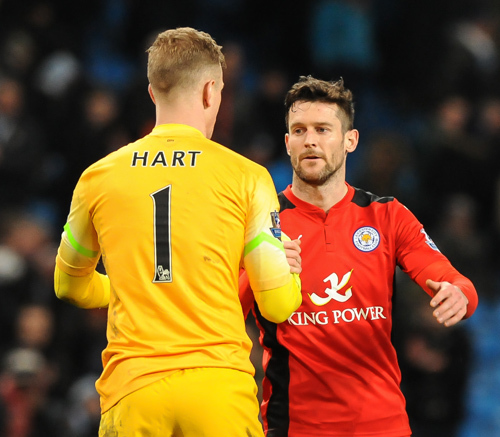 City almost went two goals ahead five minutes later, but Vardy’s header from an Albrighton cross hit the crossbar. Arsenal then swept upfield and Walcott was sent clear of the defence by Cazorla and his low finish past Schmeichel, crept just inside the far post. 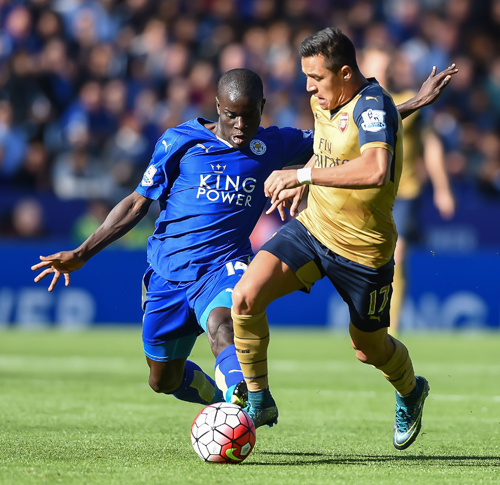 There was a controversial moment leading up to the Gunners taking the lead in the 33rd minute. As City broke forward both Okazaki and Vardy were brought down but referee Pawson waved play on. Bellerín then raced down the right flank and delivered a low cross that reached Sánchez at the far post, and he slotted home from close in to give Arsenal the lead. The ref then further enraged the home crowd when Okazaki was dragged over by Mertesacker, but loud appeals were once again ignored. Ranieri brought King on for Okazaki for the second half, though it didn’t really work for City who couldn’t match some of their fine first half play. Arsenal were looking very strong and extended their lead in the 57th minute when a clever lob from Özil teed up Sánchez for a header past Schmeichel from close in. 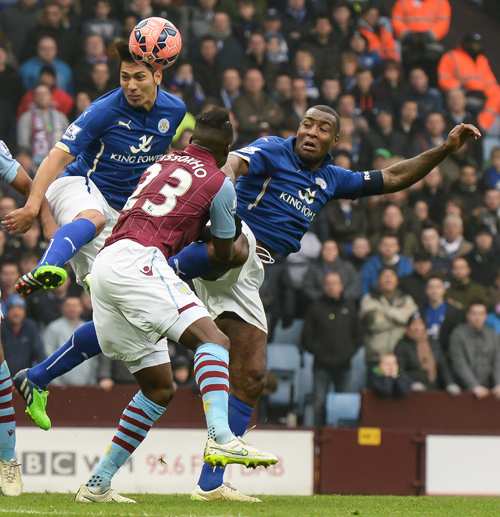 Ulloa then came on for Albrighton and he set up a chance for King who missed the target with an ambitious drive. Kramarić entered the fray in place of Drinkwater, but the Gunners further extended their lead with ten minutes remaining. Sánchez made some room for himself on the edge of the area, before sending a precise shot low to Schmeichel’s right. City pulled a goal back in the 89th minute when Kramarić was denied by Čech but Vardy was on hand to curl home a fantastic effort. But any thoughts of yet another comeback were dismissed when Arsenal broke again and Monreal set up Giroud for the visitor’s fifth. 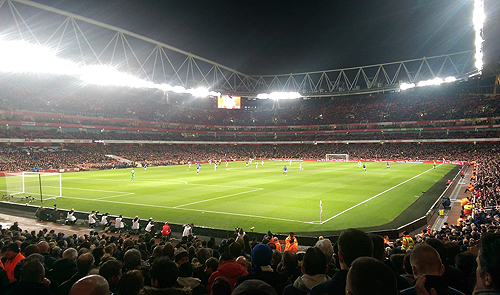 City’s unbeaten record was over, but surely Arsenal announced their title ambitions with a superb display of football. Leicester: Schmeichel, De Laet, Huth, Morgan, Schlupp, Kanté, Drinkwater (Kramarić 78), Mahrez, Albrighton (Ulloa 64), Okazaki (King 46), Vardy. Subs Not Used: Schwarzer, Simpson, Inler, Dodoo. Referee: C Pawson. Attendance: 32,047 (3,350). Get your Summer Special delivered to your door by return of post, followed by the rest of this season’s issues as they come out. 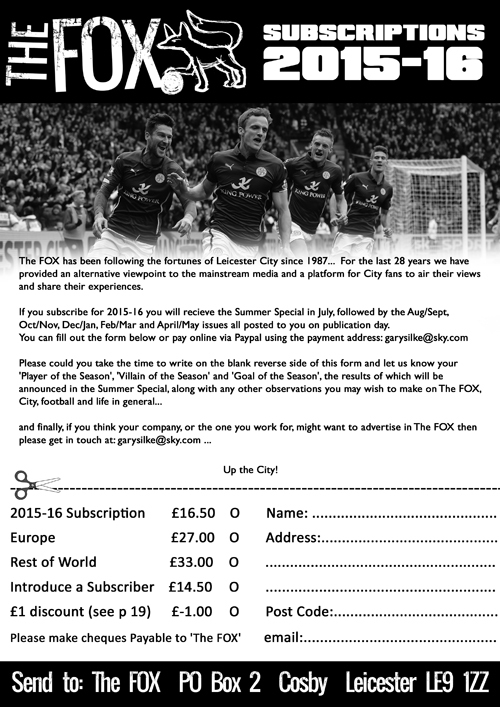 Fox Subscriptions for 2015-16 are just £16.50 – you can print off and fill in this form, or pay online via Paypal by clicking HERE. While Nigel Pearson stuck with the side that drew at Everton, the big team news of the night was City skipper Kompany being relegated to the bench. Though with City camped in their own third and at one point having just 22% possession chances to test the new-look defence were rare. In the third minute Bony, met a Silva’s corner, but Cambiasso cleared comfortably off the line. Other than that, a packed Leicester defence managed to restrict City to a long range effort from Toure that didn’t test Schwarzer. But it was Leicester who should have made a breakthrough when Schlupp broke down the left only to be pushed over by Bony for a clear penalty, but referee Robert Madley waved play on. In the 25th minute they were more appeals from the visitors when Kramarić, chased a Mahrez through ball into the area and was upended by City keeper Hart, though he appeared to just touch the ball before the man. The evening then got busier for Schwarzer as he produced good saves to deny Bony and then Toure. A clever lob from Silva then sent Bony clean through but he blazed his finish high and wide. Just when it looked as though Leicester could congratulate themselves on surviving the half unscathed, some static defending in injury time saw Silva reacting swiftly to a rebound off Morgan to put the Champions ahead. Leicester had another penalty denied them early in the second half when Kramarić was tripped by Fernando just inside the area. This time referee Madley saw the foul but placed it outside the box. Kramarić sent the free-kick inches wide of the left hand upright. In the 57th minute Pearson made his first changes, with Nugent and Vardy on for Koncheksy and Kramarić. The hosts started to turn th escrew on Leicester, but some fine saves from Schwarzer kept them at bay. By this point he was flinging himself around his goalmouth to deny efforts from Toure, Kolarov and Silva. Amidst this action was one great chance for Leicester when Mahrez beat the unsighted Hart with a low shot, but he hit the right hand post. Soon after that Mahrez made way for Ulloa, but Leicester appeared to run out of steam in the last fifteen minutes. It was City who added to the scoreline late on when Milner found too much space in the goalmouth to prod home a Navas cross and seal the victory. While replays showed that City should have been awarded two penalties, we are left wondering what could have been achieved with a more adventurous set-up against a side that have not been at their best in recent weeks. Man City: Hart, Demichelis, Sagna, Kolarov, Mangala, Silva (Lampard 79), Fernando, Navas, Toure, Aguero (Dzeko 85), Bony (Milner 72). Subs Not Used: Caballero, Kompany, Zabaleta, Clichy. Leicester: Schwarzer, Konchesky (Nugent 57), Morgan, Upson, James, Huth, Schlupp, Simpson, Cambiasso, Mahrez (Ulloa 76), Kramarić (Vardy 57). Subs Not Used: Drinkwater, King, Hamer, Wasilewski. Referee: R Madley. Attendance: 45,000. Nigel Pearson made one change with Huth back in for Wasilewski – the same line-up as at Arsenal. Although Schlupp forced an early save from Howard and Besic tested Schwarzer with a long-range effort it was a cagey an fairly uneventful opening half hour. Having been set up nicely by Coleman, Lukaku then skied his shot well over; while Kramarić, always willing to have a crack, sent a curling shot just over Howard’s bar. 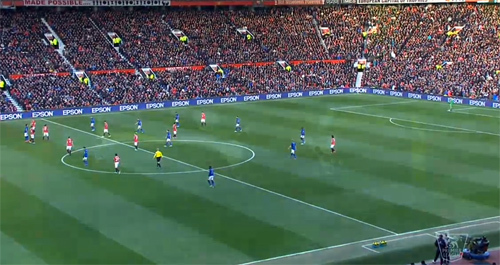 Lukaku then saw his shot blocked by Morgan and Barkley seized on the loose ball but fired way off target. The last chance of the half fell to City but Schlupp became the latest player to give their shot too much altitude. City started the second half brightly, with Howard saving from James and Mahrez going close from a corner, and Roberto Martinez made a double substitution. A minute later, the Toffees took the lead. 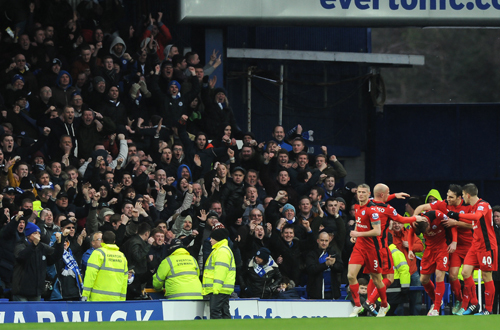 Naismith deceiving Schwarzer with an oddly struck shot that found its way through a crowded penalty area. It was now Pearson’s turn to make a double change for City, with Nugent and Vardy coming on for Schlupp and Mahrez, and the effect was the same – an immediate goal. Vardy went charging down the right and sent over a low cross. Howard got in a tangle with a defender at the near post and the ball was presented to Nugent for a tap-in from three yards. Lukaku let City off the hook with another off-target effort from a good position, and the visitors then took the lead with 20 minutes remaining. After a Simpson cross was diverted to Vardy he set up Cambiasso for a neat finish that had the away section celebrating wildly. A win would have left City just 2 points from safety, and although they held out until the 88th minute, Lukaku finally managed to get an effort on target. 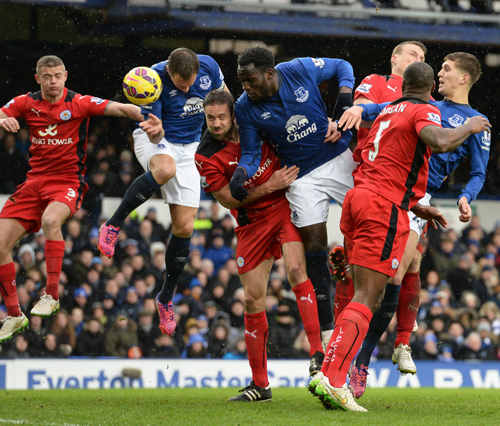 Atsu delivered a pinpoint cross from the left and Lukaku’s diving header beat Schwarzer, possibly via Upson’s head. The gap to safety was instantly doubled to four points and although City desperately sought a late winner they had to be content with a point. Although we might have settled for that before the game, it felt like a defeat. Everton: Howard, Baines, Jagielka, Lukaku, Naismith (Miralles 85), McCarthy, Besic (Atsu 55), Barkley (Gibson 55), Coleman, Lennon, Stones. Subs Not Used: Robles, Kone, Garbutt, Alcaraz. Leicester: Schwarzer, Konchesky, Morgan, Upson, James, Huth, Schlupp (Vardy 62), Simpson, Cambiasso (King 86), Mahrez (Nugent 62), Kramarić. Subs Not Used: Drinkwater, Hamer, Ulloa, Wasilewski. Referee: P Dowd. Attendance: 38,904. Nigel Pearson made one change to the side that played at Arsenal, with Wasilewski in for the cup-tied Huth, so a five-man defence lined up against a very goal-shy Villa side. Villa got off to a better start, with new boss Tim Sherwood sat in the stands and featuring regularly on the big screens, though Weimann sent their best chance sailing over the bar. City then went close from a James corner, Wasilewski’s glancing header had Given beaten but brushed the right hand post. In a half of few chances City’s next came on the half hour when a Cambiasso dummy made space for James to fire in a vicious shot that Given did very well to get his fingertips to, sending the ball inches wide. Benteke got the ball into City’s net just before the break but Villa celebrations were halted by an offside flag and the sides went in goalless after a half that wouldn’t have gripped the nation. Attacking the Holte End, and having had their first half-time team talk from Sherwood, Villa looked more likely to open the scoring, especially as City were having terrible trouble retaining possession. Delph sent a header over the bar and then Schwarzer smothered a Benteke effort. Delph then sent a shot from a free-kick wide. 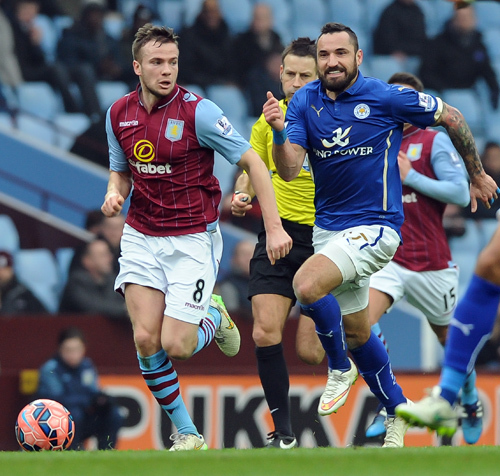 Nigel Pearson made a change on 65 minutes, bringing Ulloa on for Wasilewski, but just three minutes later Villa took the lead. Bacuna cut in from the left and delivered a fine shot beyond Schwarzer and into the far corner to break the deadlock and delight the home fans. It could have been 2-0 soon afterwards, but Upson put in a fine last-ditch challenge to prevent Benteke from adding to the scoreline. City best chance of a reply came when an Ulloa effort was saved by Given, who then blocked Kramarić’s follow-up. A few attacks were mounted to no great effect as City by now looked very ponderous and disjointed. Villa added a second as the clock reached 90. Morgan failed to cut out the ball over the top and substitute Sinclair sealed the home side’s place in the quarter-finals after a Schwarzer fumble. Somewhat perversely, as soon as the game was beyond them City found the net at last. Kramarić sent an outstanding header past Given from a Schlupp cross to give City’s huge following something to cheer, but it was too late to make a difference. The final whistle was heralded with chants of: “What a load of rubbish!” from an extremely disenchanted away crowd. 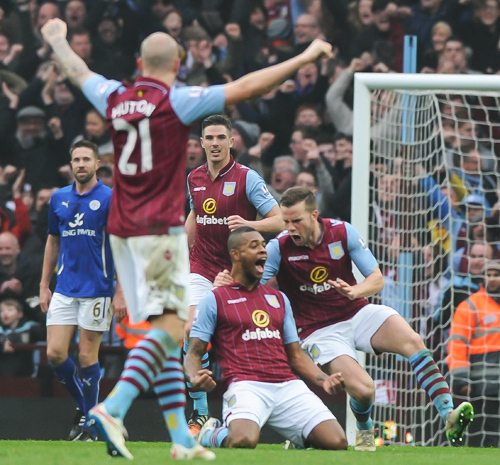 Villa: Given, Hutton, Cissokho, Clark, Vlaar, Bacuna (Sinclair 77), Cleverley, Westwood, Delph, Weimann (Grealish 83), Benteke. Subs Not Used: Guzan, Okore, Cole, Sanchez, Lowton, Grealish. Leicester: Schwarzer, Simpson, Wasilewski (Ulloa 65), Morgan, Upson, Konchesky, Mahrez, Cambiasso, James, Schlupp, Kramarić. Subs Not Used: Hammond, Vardy, King, Albrighton, Hamer, Moore. Referee: M Clattenburg. Attendance: 28,098. Nigel Pearson made three changes to his starting XI with Huth and Upson making their debuts alongside Morgan in a three-man central defence, and Kramarić making his first full league appearance; Wasilewski, Ulloa and Nugent making way. City adopted an up and at ’em approach from the start in a fixture they hadn’t won since the days of Jimmy Bloomfield. 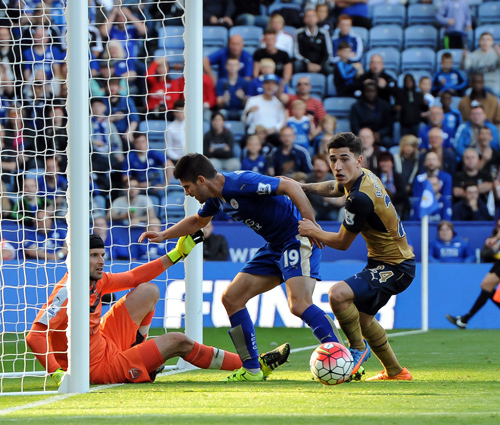 Mahrez saw his shot deflected wide, and then James’ half-volley was blocked by Bellerin. Mahrez then went agonisingly close when his shot went through Ospina’s legs but just wide of the far post. Arsenal then began to gain some ground and Walcott should have put the Gunners ahead when he broke clear on goal but Schwarzer pulled off a fine block. Schwarzer then produced another save to deny Ozil but Arsenal took a 27th minute lead from the corner. From Ozil’s flag-kick Koscielny left Morgan standing as he raced to the near post for a neat finish. Although City continued to press forward they wen tin at the break 2-0 down. Ozil’s 25-yard effort was parried by Schwarzer, but only into the path of Walcott, who fired the ball home. Just before the hour Upson had to limp out of the action, replaced by Wasilewski, and City struck back a couple of minutes later. After some great battling from Cambiasso on the right, the ball was worked out to Kramarić 18 yards out, who arrowed home his first goal for City. City were the better side at this stage, but Mahrez sent a curling effort narrowly off target and then Kramarić elected to try and lob Ospina when clean through but delivered the ball straight into the keeper’s grasp. With Ulloa and Nugent on for Morgan and Schlupp City desperately sought an equaliser, but they were contained by Arsenal’s defence and ended up with nothing to show for their considerable efforts. The gap to safety extended to 5 points with a tough looking schedule coming up. Hopefully the FA Cup will offer some cheer on Sunday. Arsenal: Ospina, Bellerin, Mertesacker, Koscielny, Monreal, Coquelin, Rosicky, Walcott (Ramsey 73 (Flamini 85)), Cazorla, Ozil, Sanchez (Giroud 67). Subs Not Used: Szczesny, Gibbs, Gabriel, Welbeck. Leicester: Schwarzer, Simpson, Huth, Morgan (Ulloa 80), Upson (Wasilewski 59), Konchesky, Mahrez, Cambiasso, James, Schlupp (Nugent 85), Kramarić. Subs Not Used: Drinkwater, King, Albrighton, Hamer. Referee: M Jones. Attendance: 60,032. Nigel Pearson made one change to his side with Wasilewski in for Moore, while Upson made his first appearance on the bench. City looked reasonably comfortable against the formidable threat of Di Maria, Falcao and Van Persie during the early stages; but possession was hard to come by and a Schlupp effort from the left after a defensive error was a rare chance. United got a lucky break in the 27th minute which led to their opener. With Kramarić dithering in midfield, Blind nipped in and delivered a precise ball forward to Van Persie, who looked to be half a yard offside before giving Schwarzer no chance with a crisp finish. Five minutes later the game was all but up for City as United went further ahead. A Van Persie pass unzipped City’s defence down the left and Di Maria honed in on goal firing a shot at Schwarzer, who palmed it to Falcao for a finish that Wasilewski couldn’t quite prevent. Just before half-time the destiny of the points was sealed when Morgan nodded a Rooney corner past Schwarzer to put the cap on a miserable 20 minutes for City. The second half saw Cambiasso on for Vardy, in a more balanced line-up, and an improvement for City against a side no longer urgently pressing forward. Kramarić tried a very ambitious over-head effort that didn’t trouble De Gea. Januzaj sent one just over the bar for United, while at the other end Ulloa going down in the area failed to get a response from the ref. Pearson then brought Albrighton and Nugent on for Kramarić and Ulloa and it was Albrighton who delivered a perfect cross from the right for Wasilewski to nod past De Gea for his first City goal. Any thoughts of a comeback soon passed as Albrighton fired a volley over the bar. It was a day when City hadn’t done themselves justice, though results elsewhere meant that they didn’t lose any ground. United: De Gea, Shaw, Jones, Rojo, Di Maria, Falcao (Wilson 80), Rooney, Januzaj, Blind, Van Persie (McNair 68), Valencia (Mata 77). Subs Not Used: Smalling, Herrera, Fellaini, Valdes. Leicester: Schwarzer, Simpson, Wasilewski, Morgan, De Laet, Drinkwater, King, Vardy (Cambiasso 46), Kramarić (Albrighton 62), Schlupp, Ulloa (Nugent 62). Subs Not Used: Konchesky, Upson, Hammond, Hamer. Referee: M Atkinson. Attendance: 75,329.